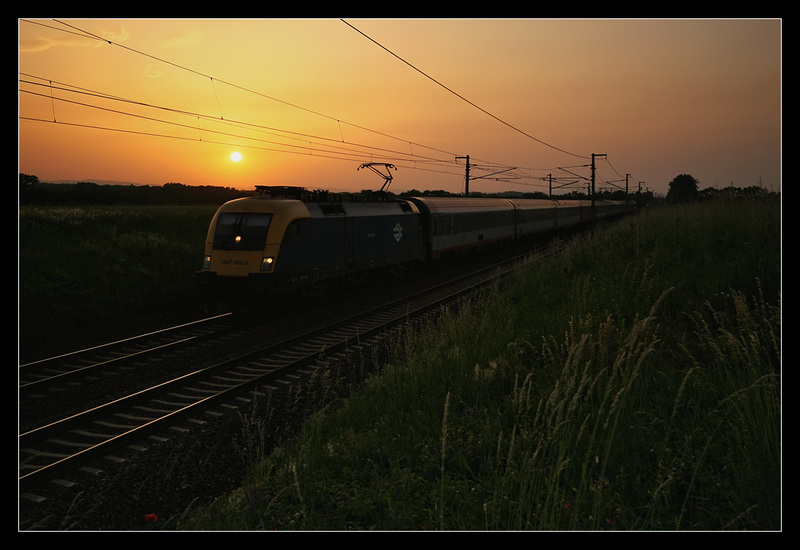 Only once I had tried to use EuroNight 262 "Orient-Express" from Vienna all the way to Paris, but sadly SNCF left us stranded on August 13 2002 at Strasbourg to continue by Corail-daytime-express (of course before completion of the LGV Est highspeed line). 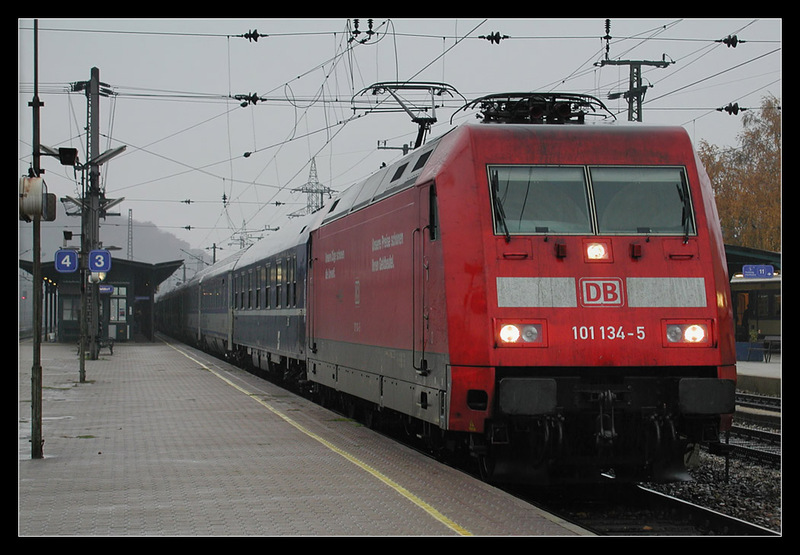 Our sleeping coach attendant told us that had been the case quite often, a few years later the train would be renumbered EN 264, then 468, and the route shortened to Strasbourg before its final cancellation in December 2009. 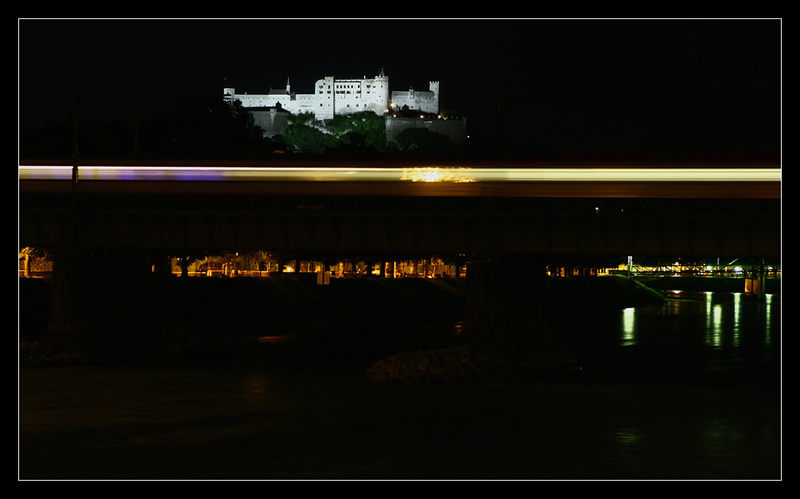 Shortly after midnight on July 20 2006 EN 262 left Salzburg Hbf westbound across the old River Salzach bridge. 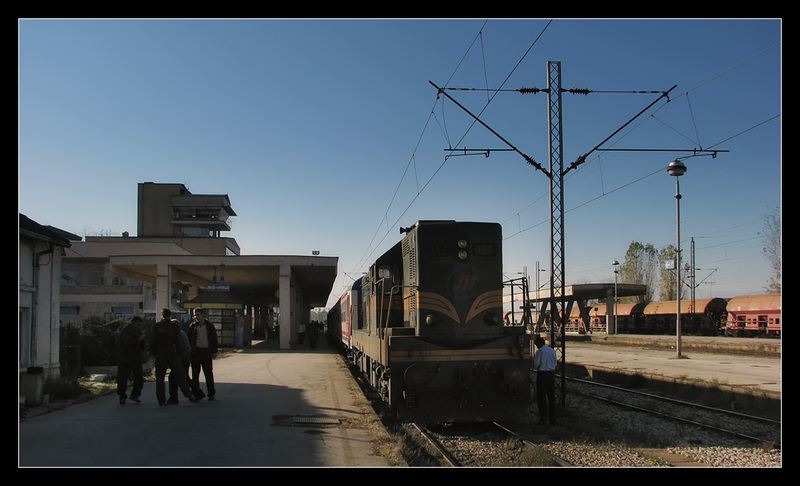 An alternative: on September 29 2007 a long-distance steam special by German rail touring company IGE returned from the Bosporus, here at Austrian border station Marchegg taken over by 919.138 from Bratislava (where the original express also stopped, see map). 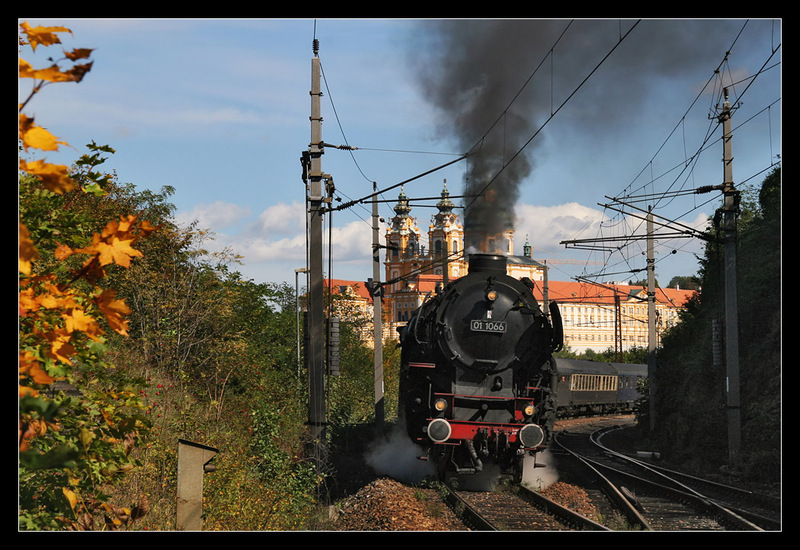 From Vienna they continued hauled by 01 1066 on the good old Westbahn line past Melk monastery. 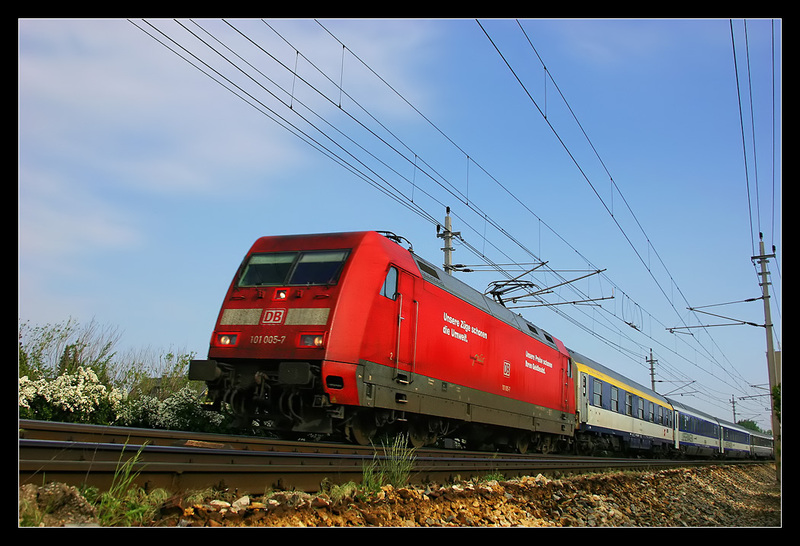 Well, on May 20 2004 EN 263 from Paris rushed past me punctually at Böheimkirchen. 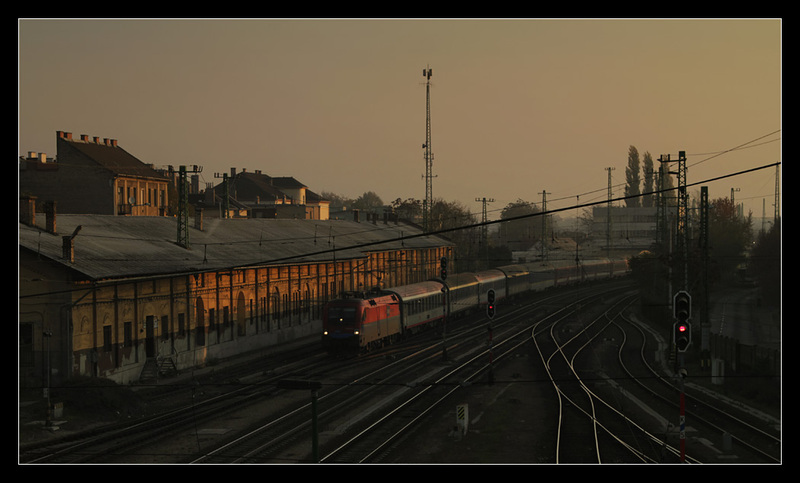 And on foggy November 7 2003 at Vienna Hütteldorf. 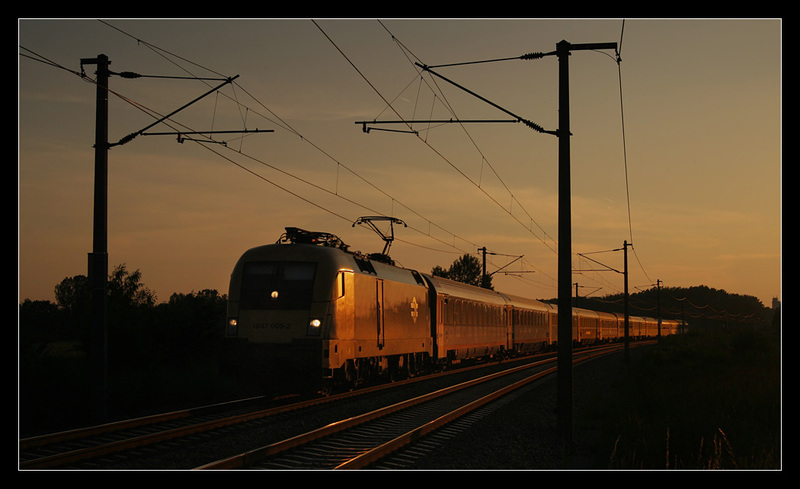 Time flow: EN 264 "Orient-Express", already to Strasbourg, leaving Vienna Western Station in the evening of May 12 2007. 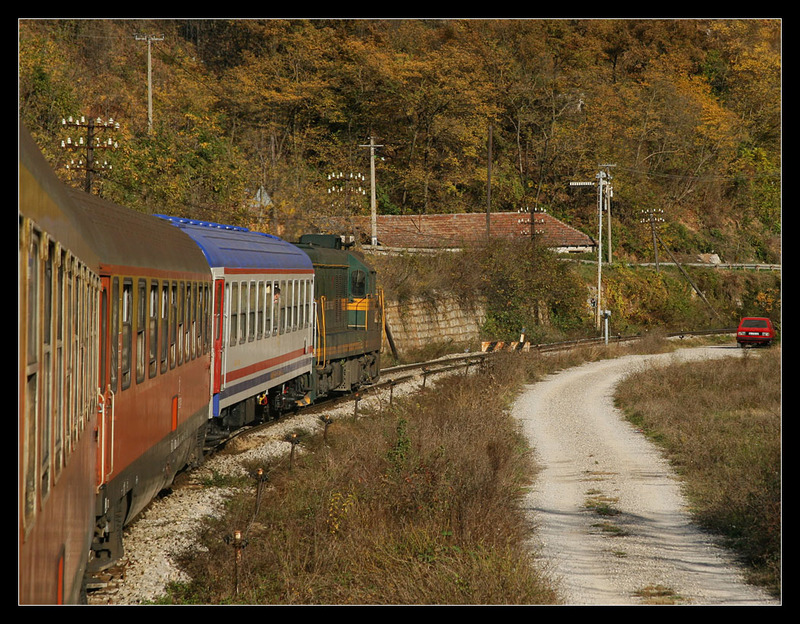 Next we look at the only legitimate modern successor of "Orient-Express" east of Vienna: (then) D 347 "Dacia" Vienna - Bucarest with through coaches to Belgrade as well as ("sometimes") Bulgarian BDZ sleeping coach to Sofia, which could be called "one coach Orient-Express". 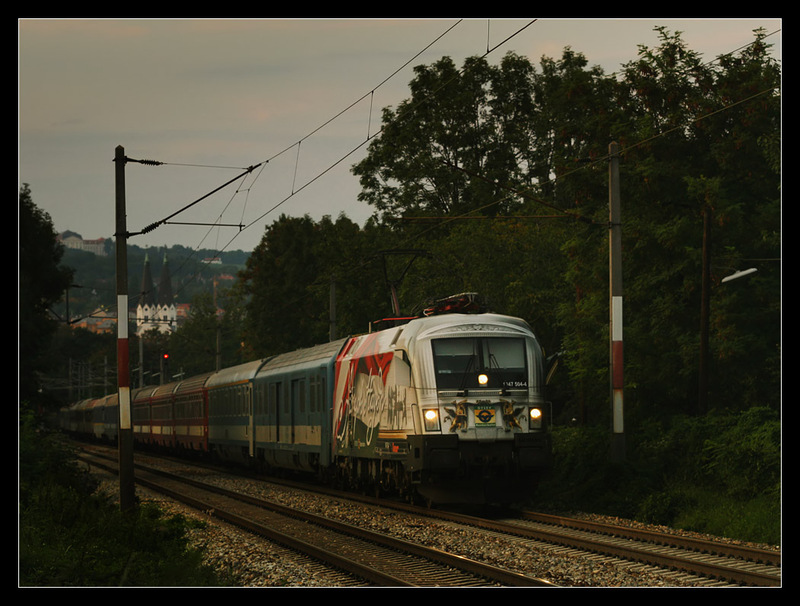 On November 2 2008 a friend and I boarded the train at Vienna, however, we did not trust the unreliable BDZ coach often remaining in Budapest and rather booked berths in the classic ÖBB class P coach to Belgrade. 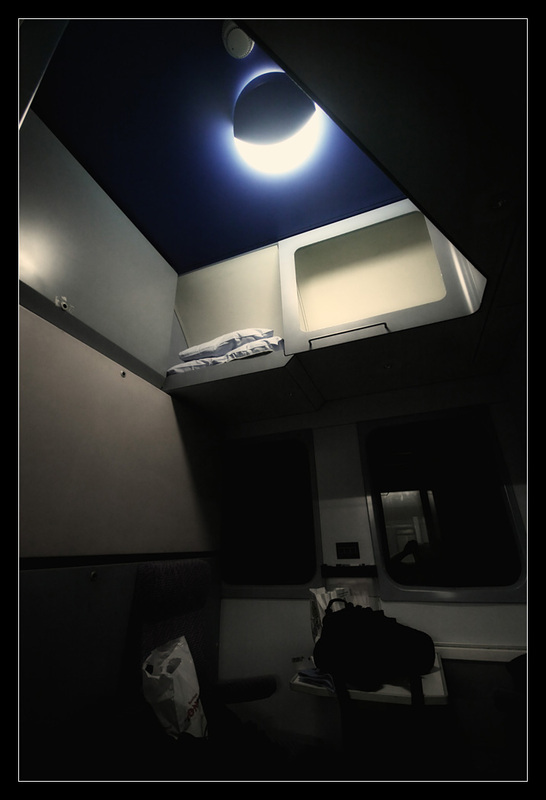 Definitely my favourite sleeper compartments in daytime position. The half moon on the ceiling already set the mood for the tour. 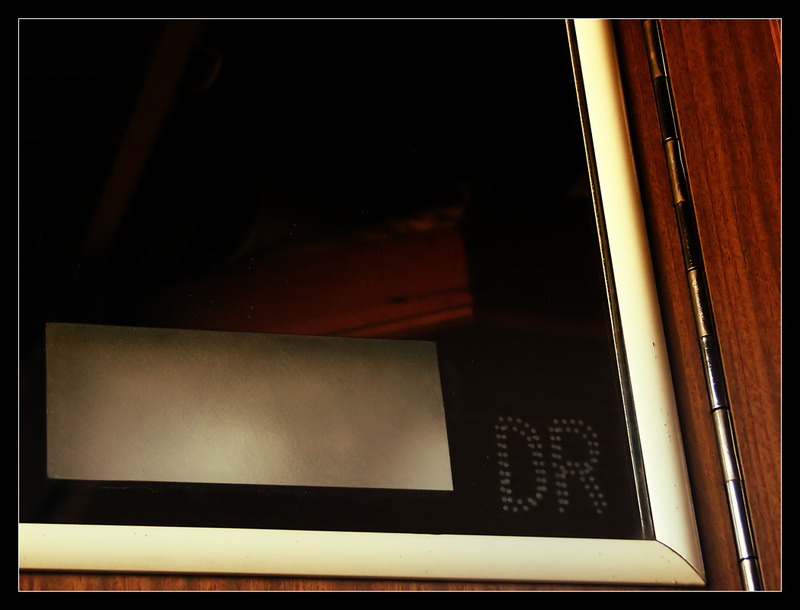 A nice feeling to rest in a comfortable compartment and watch busy platforms outside. 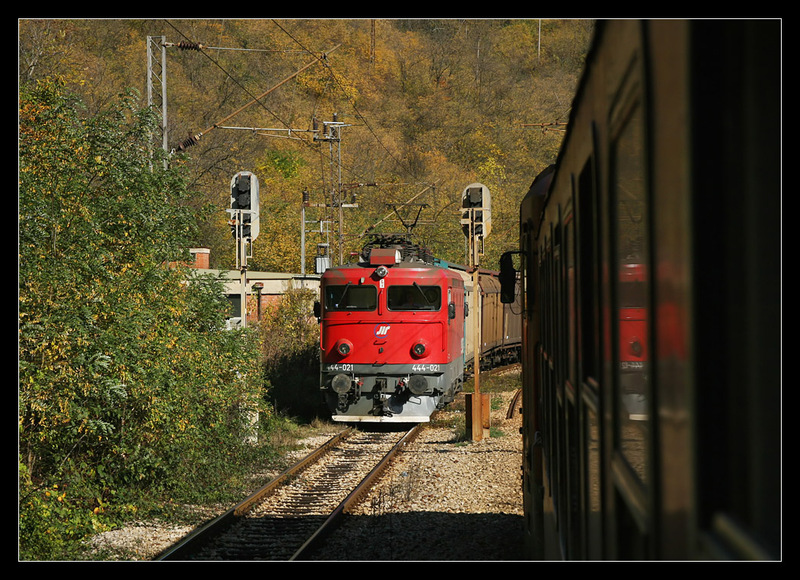 Now let's take a look at a few "Dacias" around Vienna: GySEV 1047.504 electric in special "Joseph Haydn" livery hauling D 347 on August 28 2009 along the "connecting railway" near Vienna Speising. 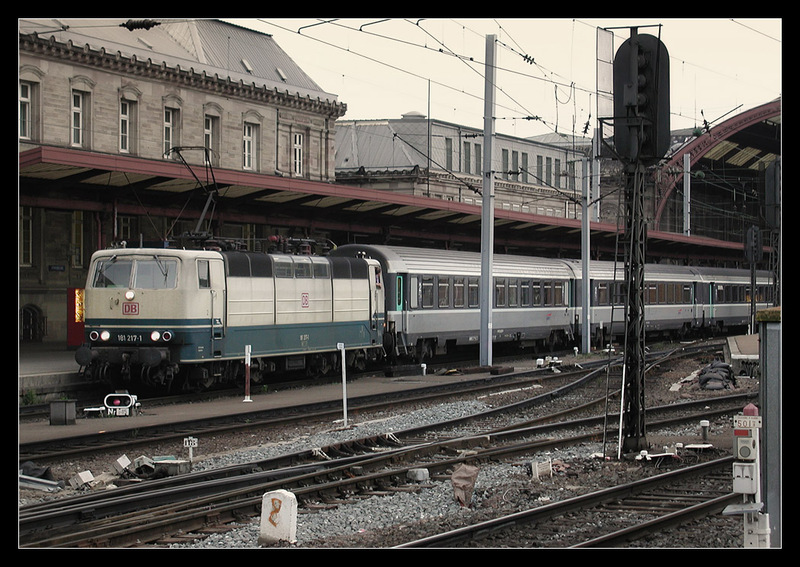 D 346 on April 18 2004 near Vienna Maxing showing the many colourful variations this train had to endure. 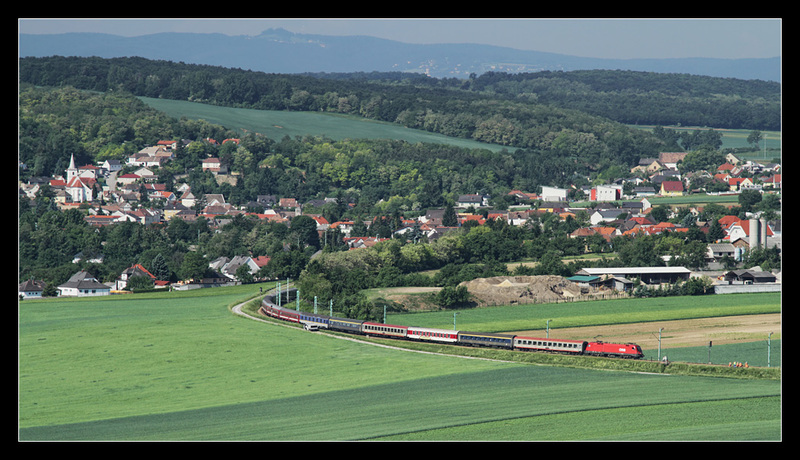 I took my last photo of D 346 complete with BDZ coach on May 24 2011 during a reroute through unusually hilly landscape via the GySEV horseshoe curve at Draßburg. 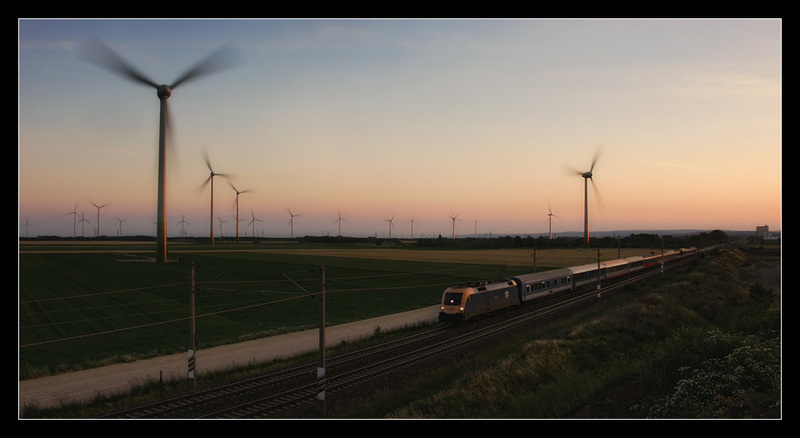 This train is a great candidate for sunset shots, D 347 approaching Gramatneusiedl, May 30 2008. 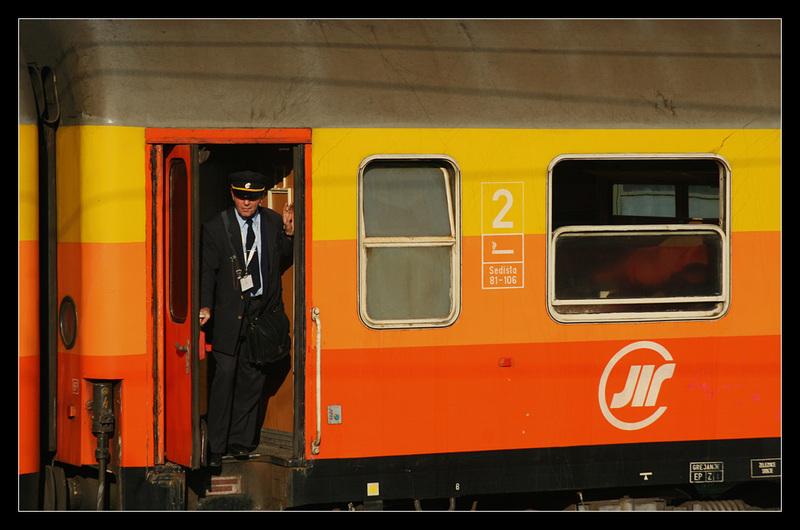 At Gramatneusiedl station, July 6 2006. Before reaching Götzendorf on June 10 2008. Near Sarasdorf the train met a class 1042, June 22 2005. Time flow near Parndorf, June 20 2005. Into the other direction "Dacia" always woke me up upon arrival by EuroNight "Kálmán Imre" at Györ while changing trains to Pápa, November 1 2011. 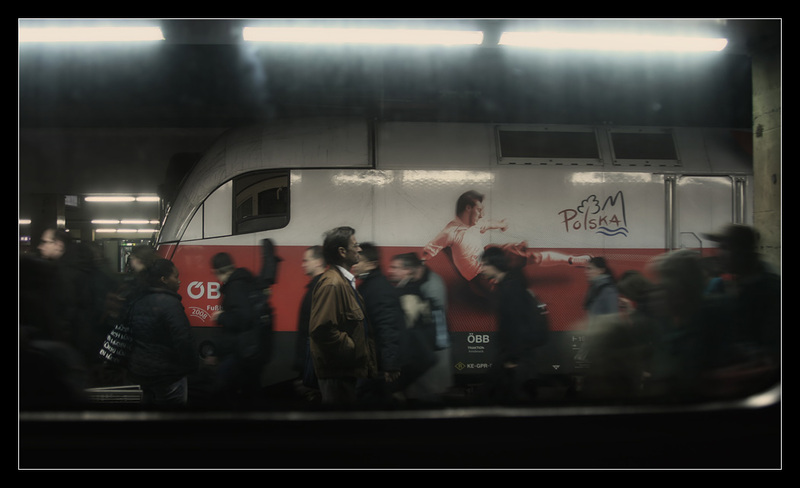 Surprisingly punctual to the minute, including through coaches from Belgrade. Again almost complete on November 5 2011. 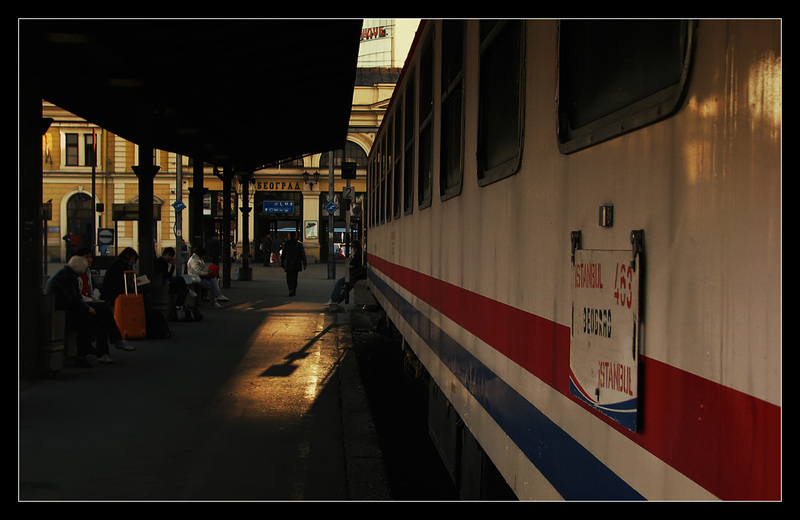 A Greek OSE-coach with reflection at Belgrade indicating possible future destinations (capture dating July 3 2009). 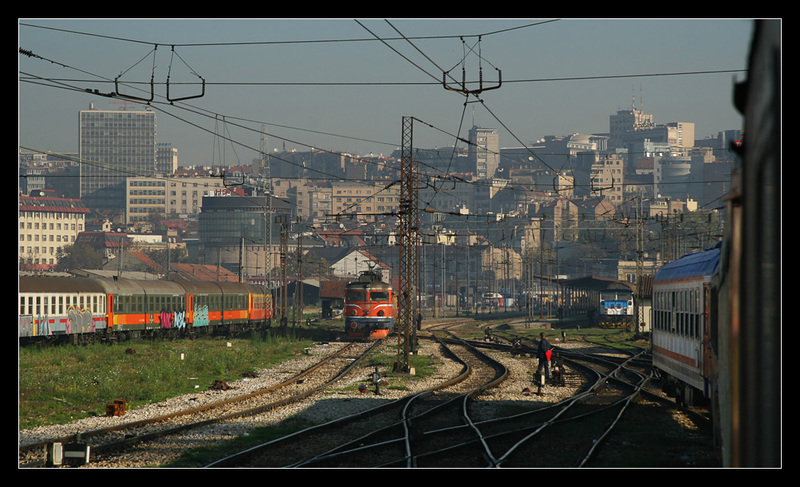 At Belgrade we first paid the nice Mr. Popovic from Wasteels a visit, we needed further reservations and my Balkan Flexipass 2nd class for five days. 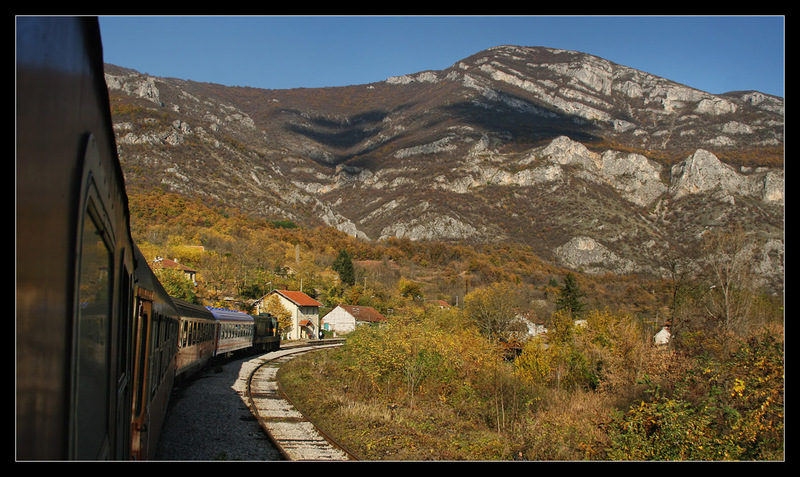 We continued at 8:40 a.m. by B 491 "Balkan Express", the TCDD-coach to Istanbul was coupled to its rear, at first we thought it might be a couchette, but it turned out to be a sleeping coach. 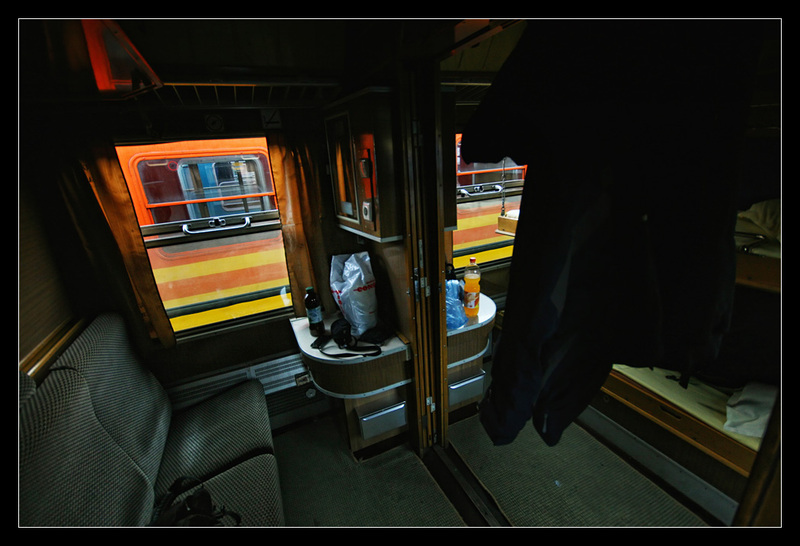 The BDZ-sleeper had travelled with us from Vienna, we arranged a compartment to Sofia with the conductor. For a negotiated bakshish - the attendant noted it on an official ticket for us - we even got a nice double compartment! The windows could stay open all the time even in November due to the sauna-like heating of the coach, also there was the most beautiful autumn weather outside. 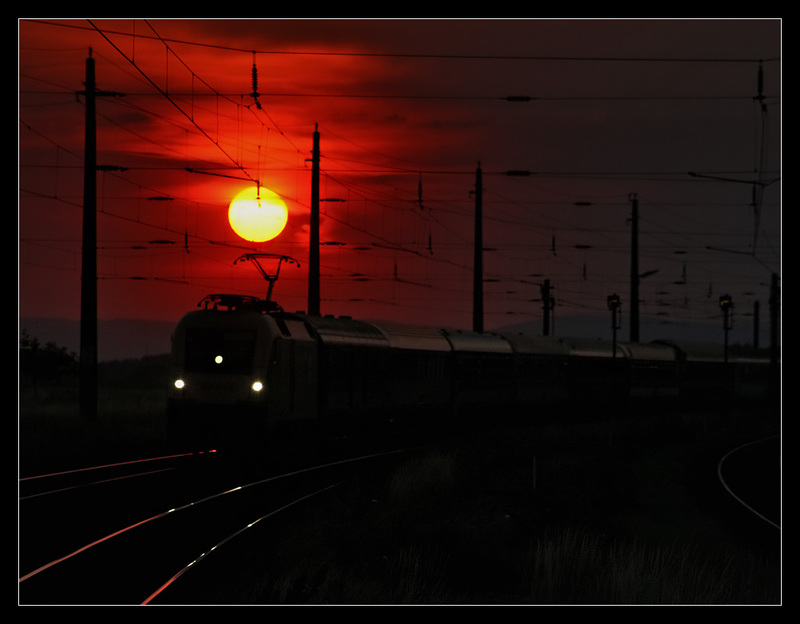 That day not only the ZS-coaches were shining. 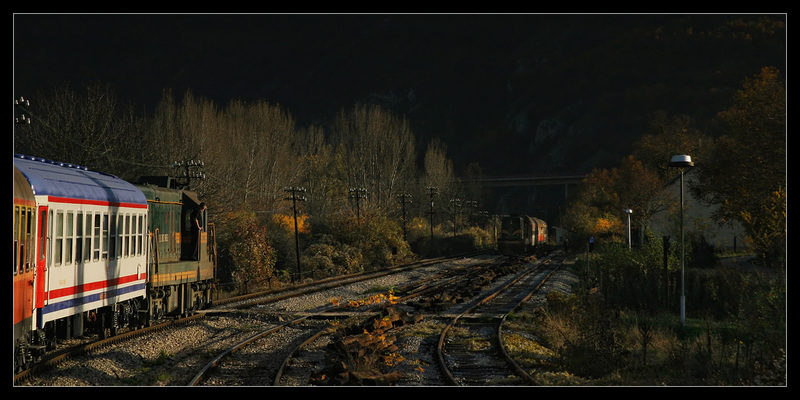 You still could spot a few Serbian locos in old livery at the time. Behind Belgrade sometimes we proceeded very slowly, temporary speed restrictions of 10/20 kph causing a delay of just 25 minutes up to Nis. 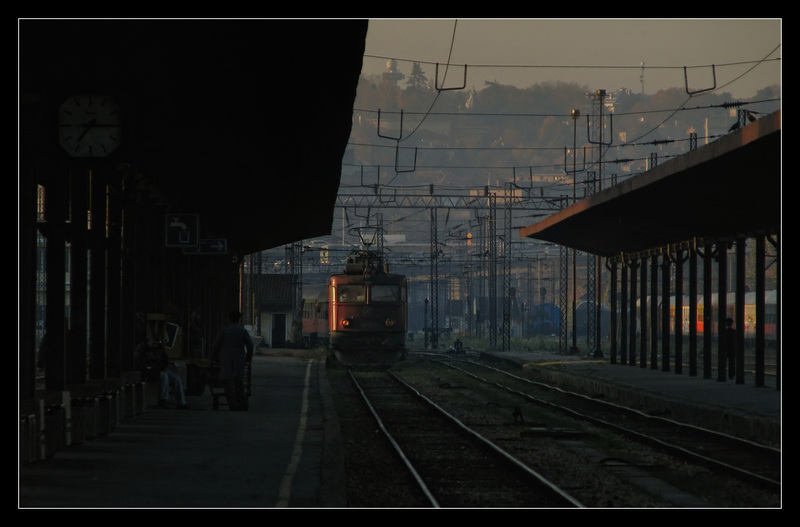 At Paracin a driver of the old Yugoslav guard on electric 441-042 told me photography was forbidden. I played ignorant tourist and waved friendly at him, obviously he was embarassed and waved back... 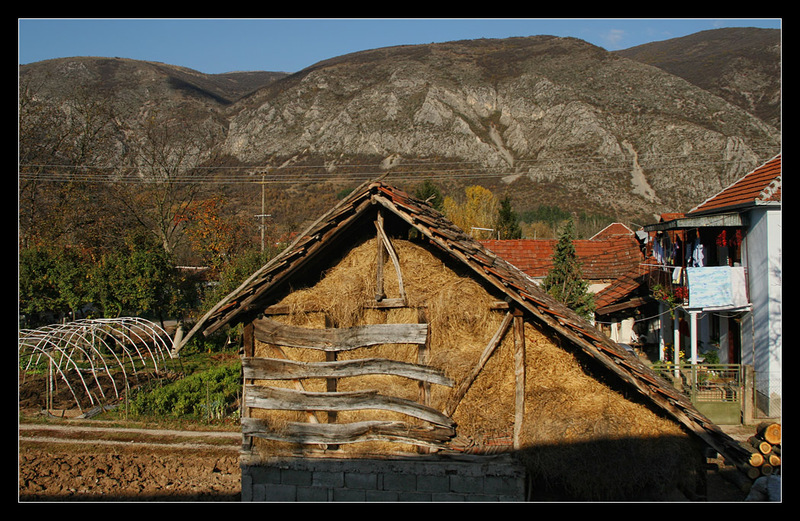 I had not taken a photo permit for transiting through Serbia, the effort would not have been justified. 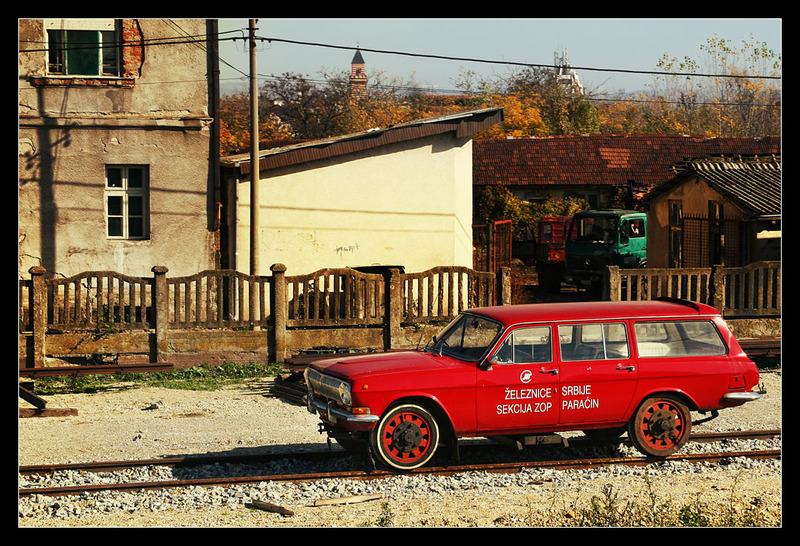 A cool Volga-vehicle at the same place even in new livery (is this a hint of a rear spoiler?)! 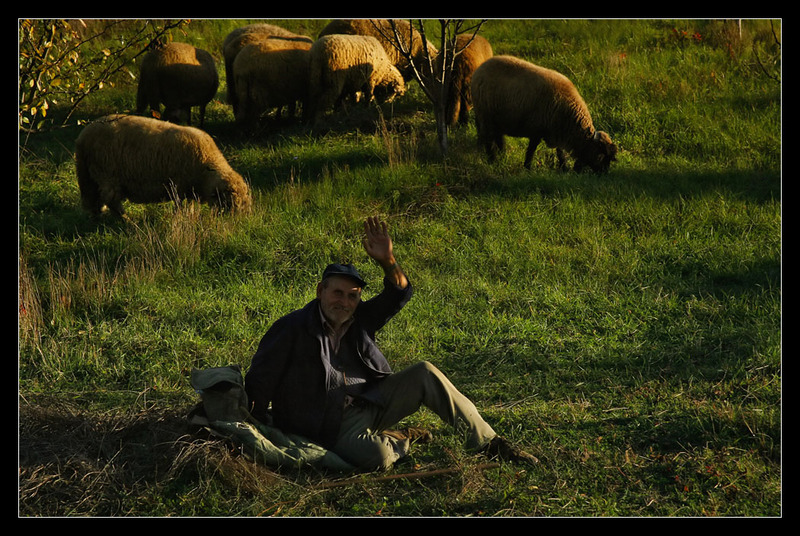 After departing Stalac we passed through lovely southern Morava river valley. 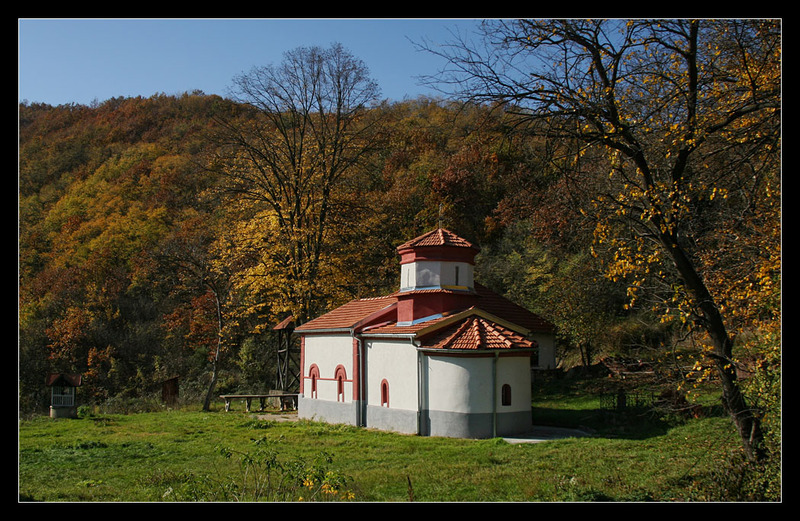 At Brajina the line passes St. Nicholas monastery. 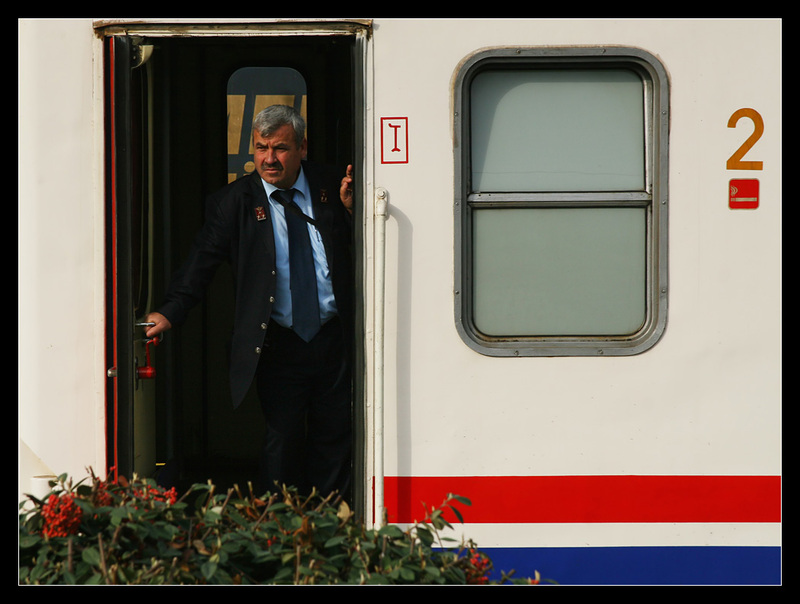 Shortly before a relatively punctual departure from Nis the original GM-EMD 661-152 was coupled to the Turkish coach. 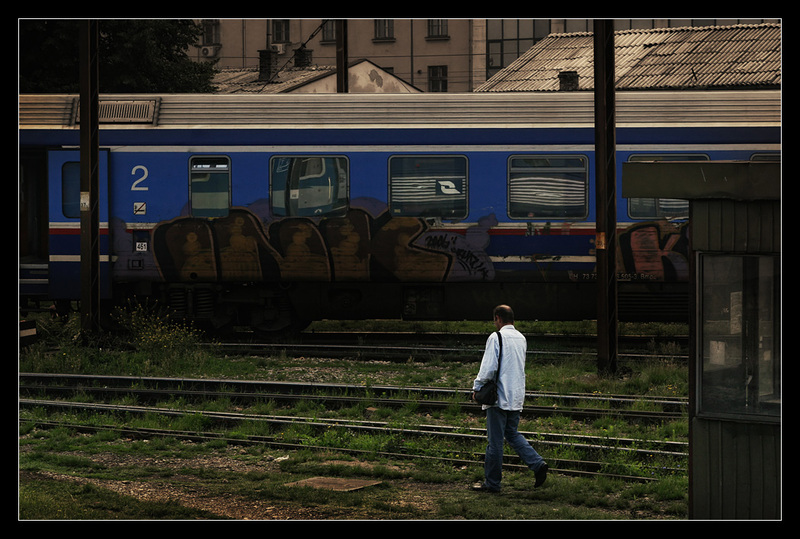 Next to the railroaders fooling around I quickly set up my compact digital and took at least this documentary pic. 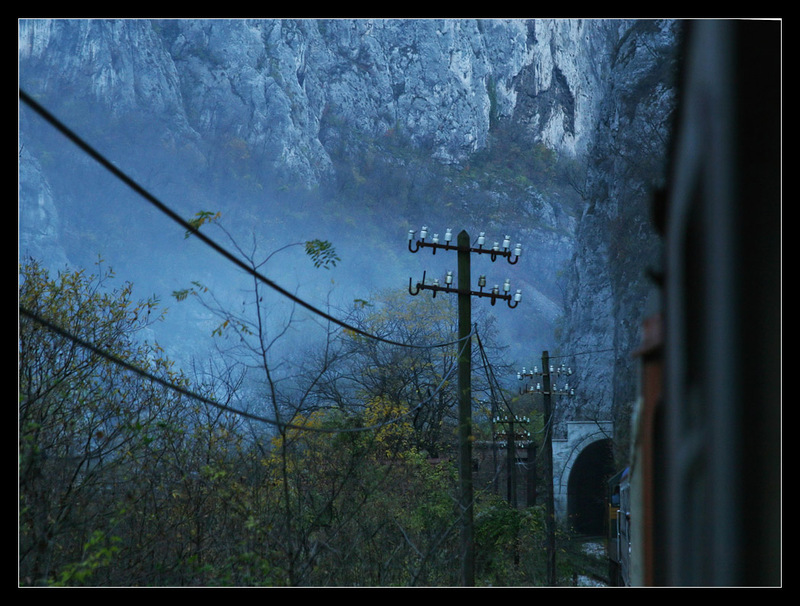 Next: the magnificent ride through Nisava river gorge, 45 minutes after leaving Nis we passed one of the best spots to take photos at Ostrovica. 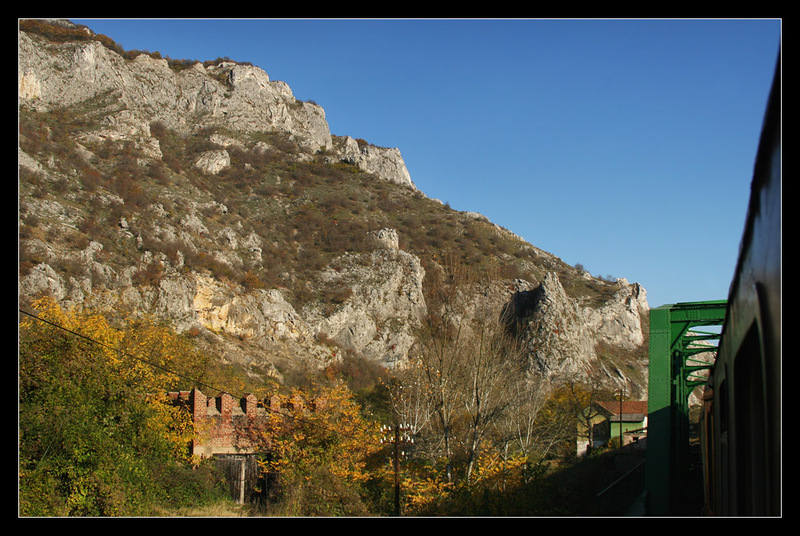 Shortly before passing a quarry, Nisava river was crossed. From Dolac the valley widened again. At Ciflik we crossed B 490 hauled by 661-138 with identical rake into the opposite direction. 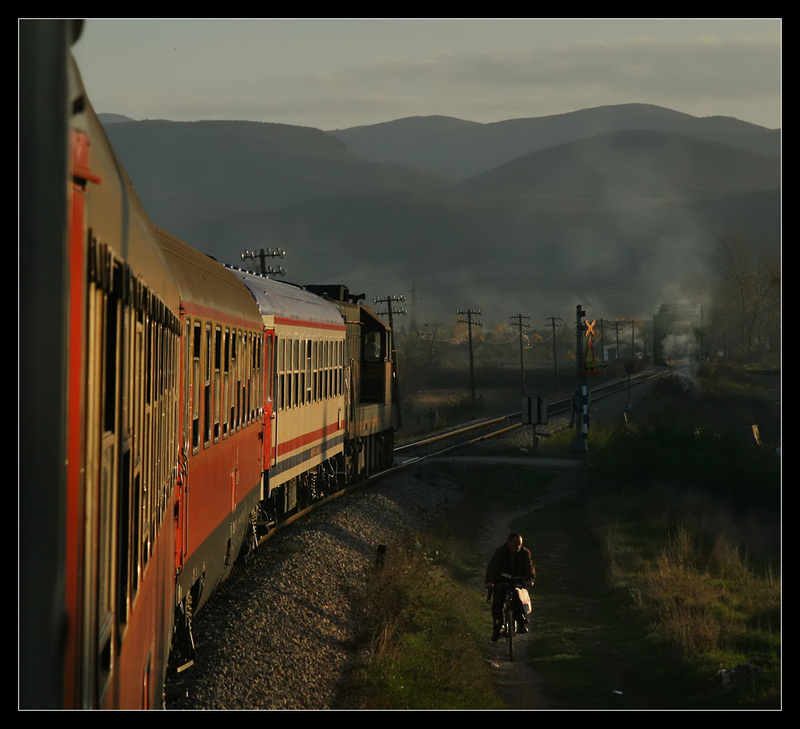 Half an hour delayed we reached the Serbian border station Dimitrovgrad, where I spotted freight trains ready to depart for the first time, before that nothing along the whole line. Border checks took their time, we left with a delay of an hour. 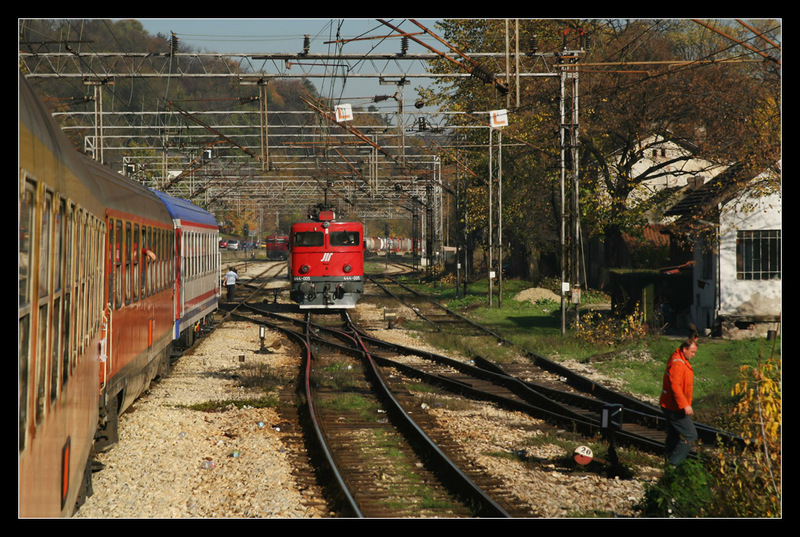 Yet obviously BDZ had no interest in getting our "Balkan Express" to its destination, simply letting it sit on sidings for another hour to let some local trains cross. Finally we reached Sofia around departure time. 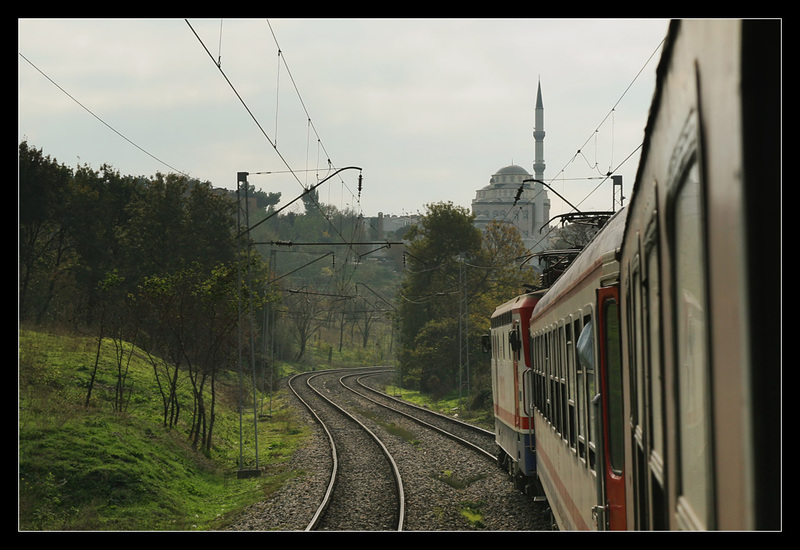 It did not matter as the same train (OK, the one TCDD-coach) continued to Istanbul, we just had to change into another BDZ-sleeper. The attendant there denied us our compartment at first as the wrong coach number had been written down on the reservation. He sent us away, but we were insistent, he checked the booking codes and suddenly everything was alright. 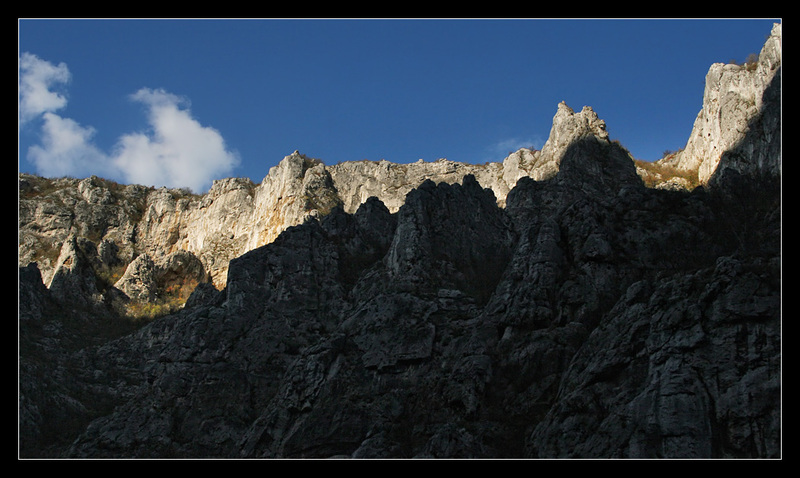 With 30 minutes delay we departed around 8 p.m., the half moon was shining auspiciously above the landscape. There was no stress with the border controls as we gathered another two hour delay in Bulgaria. 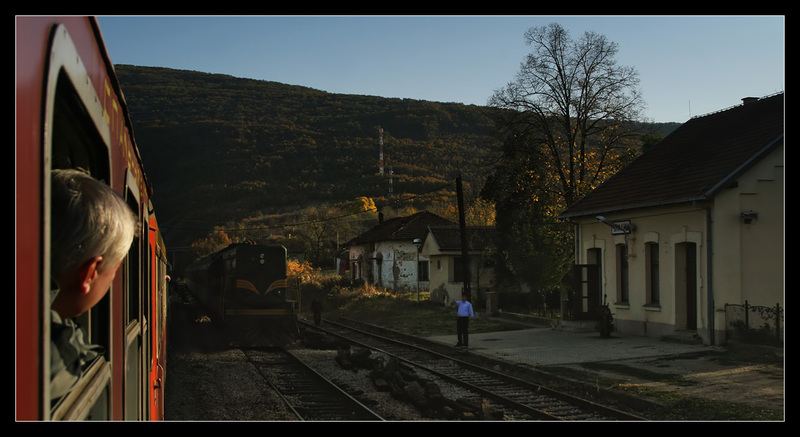 At the second Dimitrovgrad within a few hours on November 4 2008 the train part from Bucarest joined us. 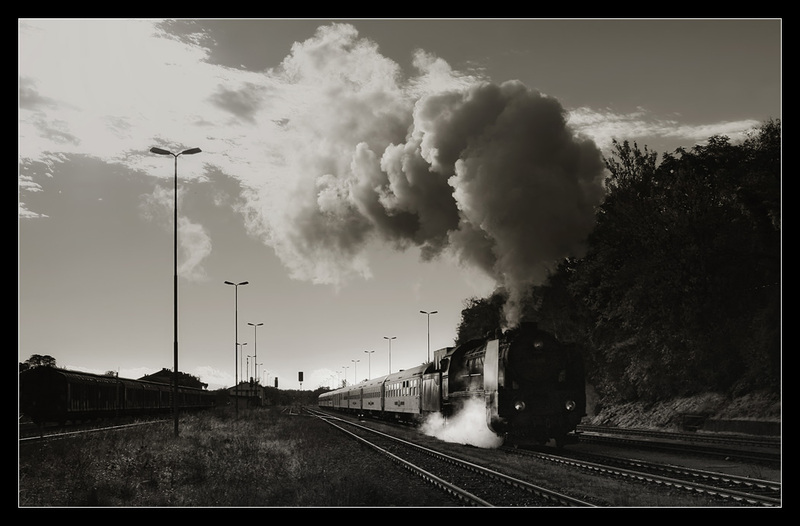 Across the border from Svilengrad we were hauled by a BDZ Ludmilla diesel, at Kapikule, where you have to get off for border controls, TCDD E52518 was coupled to the express. Although we had informed ourselves beforehand we fell into the visa trap and had to find the visa vending counter first before queueing again for entry. 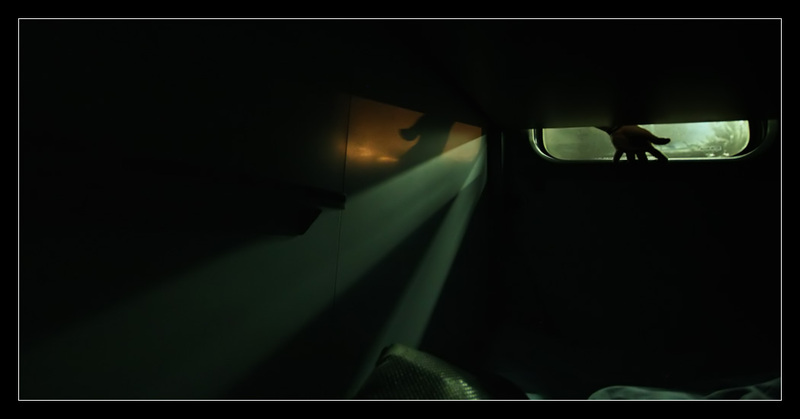 However, everything was handled quite fast and soon we could return to our berths. We kept our delay up to Istanbul, at least it did not increase due to the TCDD passing spots with temporary speed restrictions elsewhere (e.g. Serbia) at full speed. At least you could sleep late (if you managed to stay in your berth during the rodeo on those tracks ;-)), nothing happened up to Halkali. 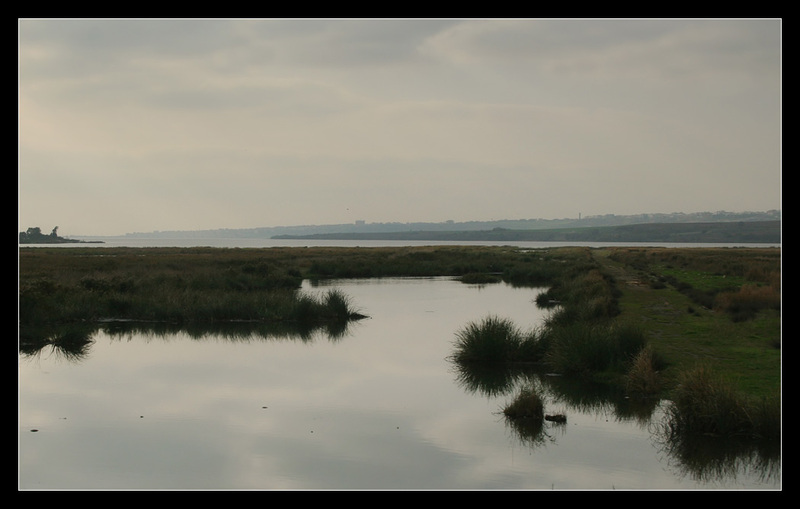 In wet landscape where you could imagine this year's floodings we reached the lakes along the Sea of Marmara coast. At Halkali we met a loco-hauled local to Uzunköprü. On we go, through the Gate to the Orient! Interesting report and nice pictures. Thanks for posting those great photos. 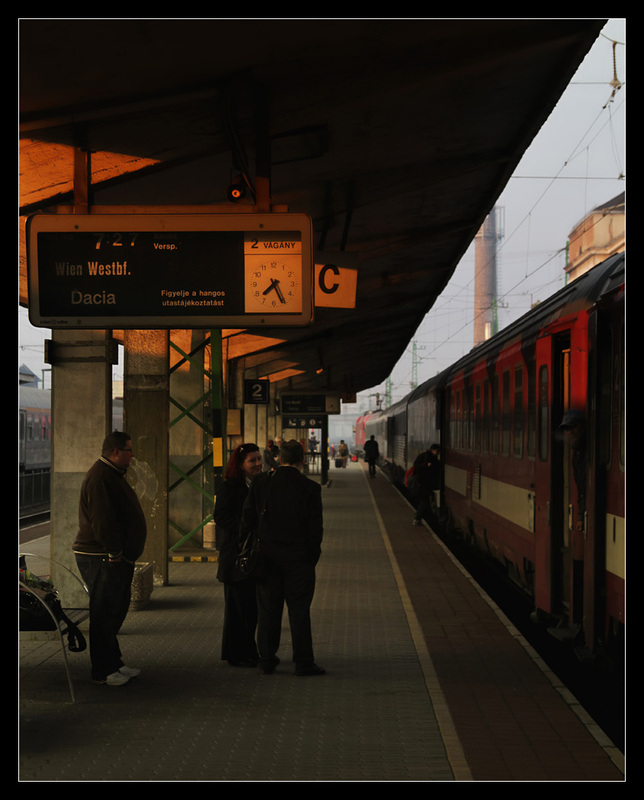 I especially like the one at Gramatneusiedl station. It's too bad you get such little response in this forum. 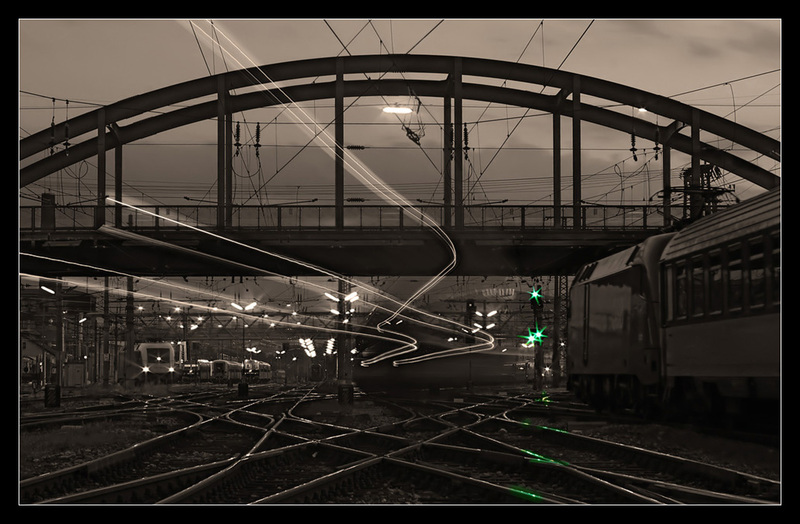 Seems that most members have their heads in the sand when it comes to railways in other countries.